Survivor Philippines 2012 Celebrity Showdown castaway Maey Bautista is totally blown away by the first dish that Chef Boy Logro presents to her. Baked Mussels with Tomato Concasse. She can't comprehend how it is possible that so delicious a dish can be done in so simple and so easy a manner! 1. 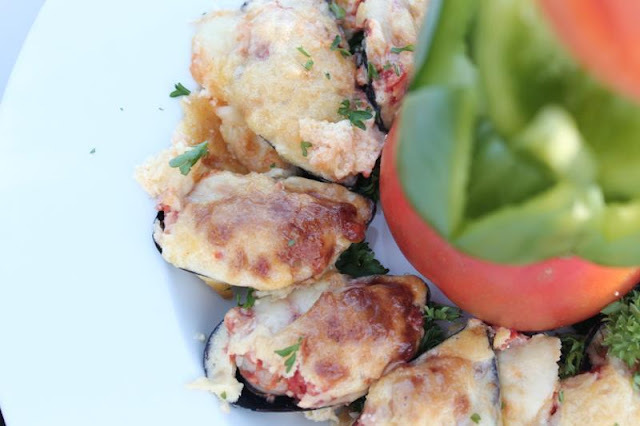 Place half shell of mussels on baking tray stuffed with tomato concasse on top with a sprinkle of bread crumbs. 2. Add grated mozzarella cheese and hollandaise sauce. 3. Oven bake until golden brown. 4. Arrange on platter and sprinkle with chopped parsley.